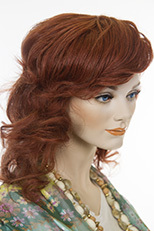 Arty, medium length, layered, curly, wavy, wig with spiral curls and soft straight bangs. The length falls to 14 inches in the back and the straight soft wispy bangs are approximately 4.5 inches long. See item details for available colors. Striking salon cut! 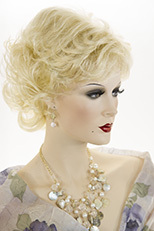 This stunning pixie hairstyle tapers at the sides and has height at the crown. See item details for available colors. Great cut, for anyone ,who would like to lengthen a fuller face. 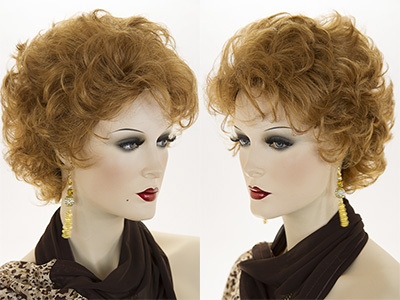 Glamorous long Reversible wavy 3/4 cap wig. 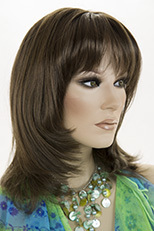 The length can be anywhere from 9 to 20 inches depending on which side of the hairpiece you place on top. Attaches easily with flexible combs. See item details for available colors. Long, luxurious hair in minutes! 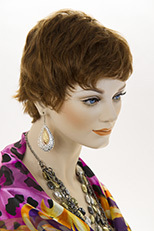 This stunning ¾ wig, adds natural looking length. The hair is approximately 23 inches long. For comfortable security there are two metal combs on top and near the nape of the neck. See item details for available colors. Perfect for a period costume! 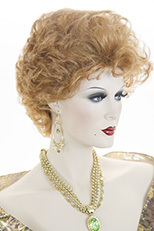 Inspired by George Washington, this fun wig completes your look! White curly hair with a braid in back.